Fleetwood Town have added to their options up front with the arrivals of Ched Evans and Chris Long. Evans has joined on a season-long loan from Sheffield United, while former Town loanee Long returns after agreeing a two-year contract. Evans (29) became Barton’s eighth summer signing and the head coach said: “When the opportunity came to get Ched on loan – a goalscorer who is proven at League One and the Championship – we knew we had to take it. Evans’ signing came shortly after Long’s return to Highbury was revealed. The 23-year-old was at Town in 2016, having joined on loan from Burnley, and scored four times in 18 appearances. A former Everton youngster, he represented England at every level from U16 to U20 but was released by Burnley at the end of last season. 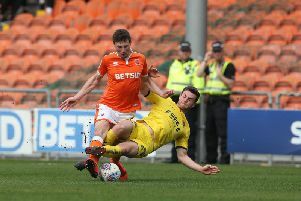 Barton said: “By bringing Longy in, it gives us variety in the front line - he brings pace and the ability to play in any of the three positions at the top of the pitch.